How Andi Arnovitz seduces the viewer visually and opens them up to a new idea or form of protest. Andi LaVine Arnovitz was born in 1959 in Kansas City, Missouri. She graduated with a BFA from Washington University in St. Louis. For many years, Andi worked in advertising as an art director, creating print campaigns and television commercials. She attributes the conceptual ideas behind many of her pieces to this work experience. Andi considers herself a printmaker, a paper manipulator, a bookmaker, and an assemblage artist. 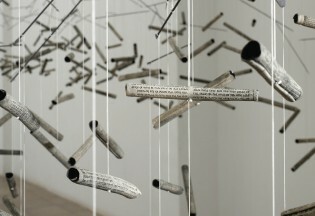 Her primary love is working with paper – printing on it, etching, drawing, sewing, tearing, and repairing. In 1999, Andi and her family moved to Jerusalem. A two-year sabbatical became a permanent stay, and much of her work is informed by the multitudinous differences of living in the Middle East. Andi has had numerous solo shows in Jerusalem, and her work has been included in many group shows all over the world, including France, Spain, England, Poland, Canada, Israel, the United States, Lithuania, and Finland. 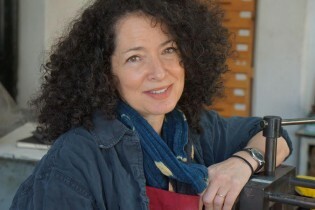 To learn more about the artist, visit her website at www.andiarnovitz.com. When you describe your work, you use the term “paper manipulator.” Tell us what you mean by that. By paper manipulator, I mean I work with paper in unexpected ways. Whether it is pushing the limits of what one expects an artist’s book to be, or assembling paper garments out of etchings or kettubot, or pushing digital printing processes to print on unexpected surfaces, or etching on odd materials, or printing on both sides of the paper and folding and curling it when wet – I am constantly exploring and playing with paper as my starting point. It’s intriguing that you love working with paper and fabric, and equally with technology. Do you find one easier or more satisfying to work with? They are all terribly exciting to me, and I use all of them equally. My work always begins with concepts and ideas, so the materials follow – whatever is the best vehicle for the idea is what I work with. Very often this involves pushing the limits of a given technique. I have printed on crazy materials digitally as well. I have a very willing and dynamic printer here in Jerusalem – Yair Medina – who is game for trying anything. We have printed on silk, tissue light as air, even toilet paper! Tell us how your Jewish identity plays a pivotal role in your art. There are zero degrees of separation between my life and my work. Whatever I am doing/worrying about/reading about/obsessing about shows up in my work. Since I am Jewish, female, both American born and Israeli, these identities are very much present in the work. Who I am informs the lens through which I see the world and thus affects the art. How did your move from the U.S. to Jerusalem change the visuals or concepts of your work? Making aliyah changed everything. I was forty years old with five young children. I was completely adrift. I had no idea of how challenging it would be, but I also did not anticipate that Israel would get under my skin so. In America, when I read the paper, everything I read was something that happened to someone else, somewhere else. In Israel, these were my people… it was my war, my security, my holidays celebrated nationally, my children who would defend the country, my heritage that informs the laws and culture. It was so very personal. When a rabbi makes an outrageous statement, it makes me ashamed. I take it very personally. So, gradually my work shifted from pretty little prints about Jerusalem (lemon trees, arches and courtyards, pomegranates, cypress trees, and the Old City) to art that focuses on the place where religion, politics, and gender meet. My goal is to seduce the viewer visually and then open them up to a new idea, or a form of protest – to make him or her consider something or create awareness of a problem of which they knew nothing. Tell us more about the way the differences between Jewish Law and contemporary society have played a role in your work. A huge part of my work is about this very tension. I chose to become observant. Being observant speaks to me intellectually and emotionally and even physically. But I also believe that the Jewish people are here today because halakhah is organic – because adapting to change while keeping the big Jewish picture in mind has kept us Jews on the planet long after other civilizations have disappeared. So, when technology and Jewish Law bump heads, that’s the place that fascinates me. For example, let’s look at the world of infertility – the treatments, egg and sperm donors and banks, surrogate carriers; watching halakhah wrestle with this is fascinating and also troubling. I really am focused on the place where religion and the individual meet – where politics gets messy and where sometimes people get hurt, or break with halakhah. Can you give us an example of art you’ve created that deals with this type of messy issue? I have a whole body of work dealing with halakhic infertility. I did an installation at the Museum of Art in Ein Harod, Israel, where people had to walk through a long hallway filled with suspended ceramic scrolls. There were little iron rods, and balanced on each rod were two scrolls: one from the Talmud or a source for Jewish Law, and the other from the contemporary newspaper. If people paid attention, they saw that the two scrolls were related to one another. One might be the halakhic source for the laws of bribery, and the other would be a newspaper article about the monetary scandal of the former prime minister Ehud Olmert. One might be the laws of redeeming the captive, and the other would be an article about Gilad Schalit. The viewer had to walk through this hallway to get from one gallery to the next, but in doing so would brush up against these clay scrolls. The sounds that the scrolls made were clearly fragile. If people were not careful, they actually broke, leaving shards on the floor. The entire installation was a metaphor for the state of Israel – a country informed by Jewish Law, but a place in which contemporary issues come into conflict with that law. Sometimes the result is breaking with halakhah, and sometimes it is breaking/hurting people. The only way forward is delicately and carefully progressing and keeping both aspects in balance. What conflicts do you face between being an observant Jewish woman and a feminist artist? There are not very many. Sometimes I worry about crossing a line in terms of modesty in my art. I have some work in which I use old pages from discarded prayer books and Gemarot (rabbinical commentary on the Mishnah), and I went to two well-known rabbis to make sure what I was doing was appropriate. But I don’t compromise my work because of fear of any kind of retribution from the religious community. I get a great deal of positive feedback from people in the observant community, as well as feminists. I find Judaism to be feminist at heart, so there really is no tension there. The ultra-Orthodox tend to not go to museums or galleries, so they have no exposure to my work. During your time at the HBI, you created Tear/Repair, a series of paper coats for Jewish women who impacted history. Could you tell us about the inspiration for that? I had been working on the coats of the agunot and the dress of the Sotah and the tzedakah vests, and so I proposed that I come to Brandeis and take advantage of the faculty and resources and research and then propose several other “coats” or garments of women who have changed history or impacted the role of women. I came to the residency knowing a few women I wanted to focus on, but during my stay at the HBI, I got to interview Brandeis professors and visiting professors and, in doing so, expanded my proposals to include women who I didn’t even know existed! It was this brilliant cross-fertilization that happens in residencies. I usually have about five or six projects going on in the studio at once. Currently I am doing three different artist’s books. One is called “The Only thing left to do with the Oslo Accords.” I had the Oslo Accords printed on toilet paper in Arabic, Hebrew, and English. It is funny and quite sad. I am doing a series of watercolor collages about the nuclear threat of Iran. I have taken the incredibly rich, decorative legacy of Persia – the rugs and ceramics and textiles – and I have dissected them and rearranged them to create a terrifying commentary about this potential nuclear holocaust. I am doing another artist’s book about the missing Nigerian school girls that everyone seems to have forgotten. I am also doing another project/artist’s book about the tunnels Hamas dug underneath people’s homes. This really haunts me. I jump around from one project to another, but there is so much material, so many issues that need to be presented. Andi, i so look forward to seeing those artist books on the issues.